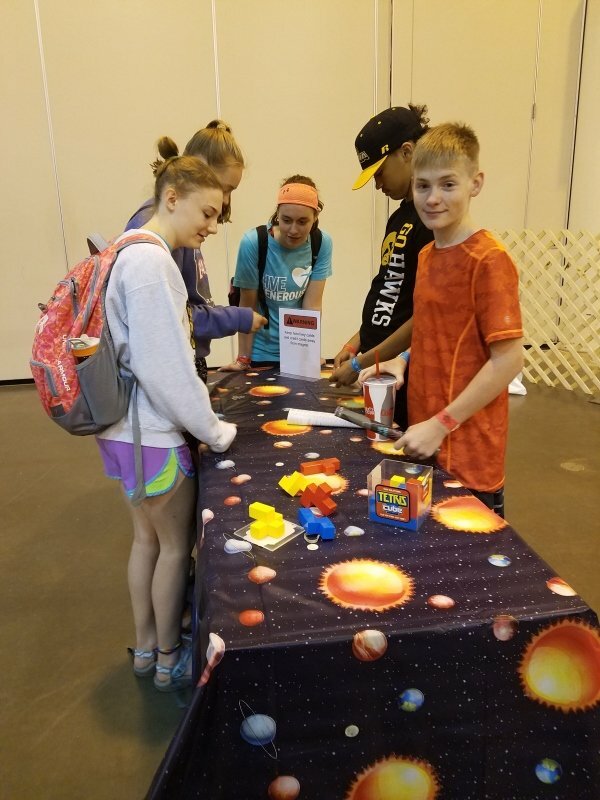 Whether it was looking for the planets in a shrunken down version of the solar system, completing science experiments on the fly or learning how to design rockets, youth attending the 2018 ELCA Youth Gathering in Houston had plenty of opportunities to engage with science. 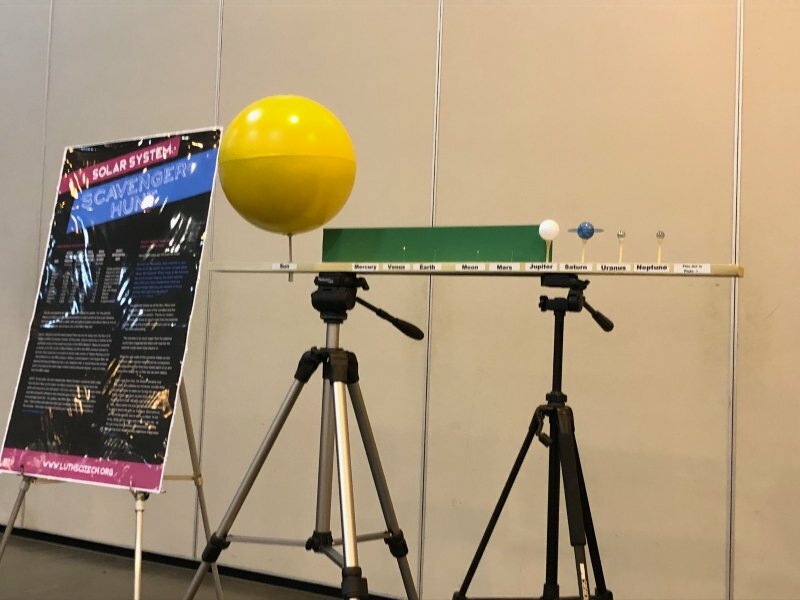 The science-oriented activities popped up at the Interactive Learning Center that was described as a “Holy Playground” of sorts, inviting Gathering participants to encounter God through a variety of learning styles and sensory experiences. All 30,000 participants had a dedicated day in the three-day program rotation to experience the extensive offerings inside the over 700,000 square feet exhibit hall. 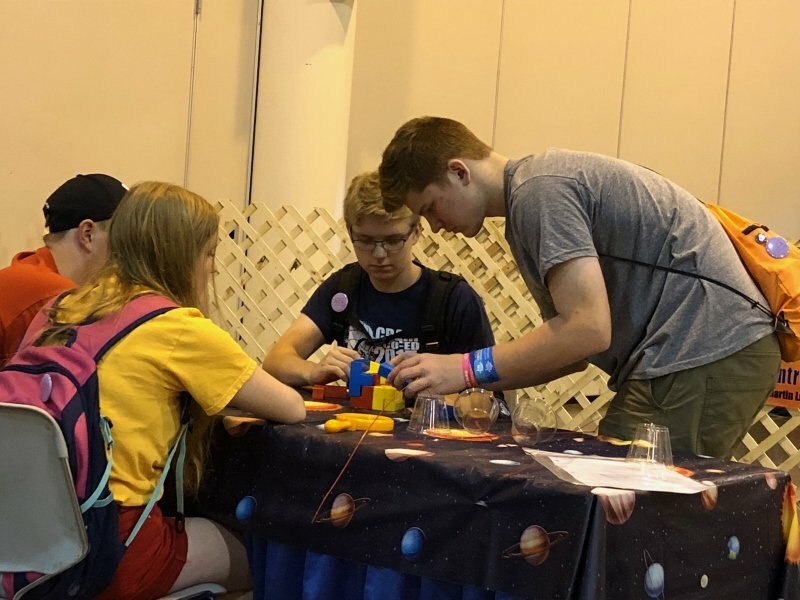 From sports to creative expressions, service projects to quiet meditation, Interactive Learning offered up a lot of activities featuring booths more than 40 organizations, including one sponsored by the Lutheran Alliance for Faith, Science and Technology (LAFST). 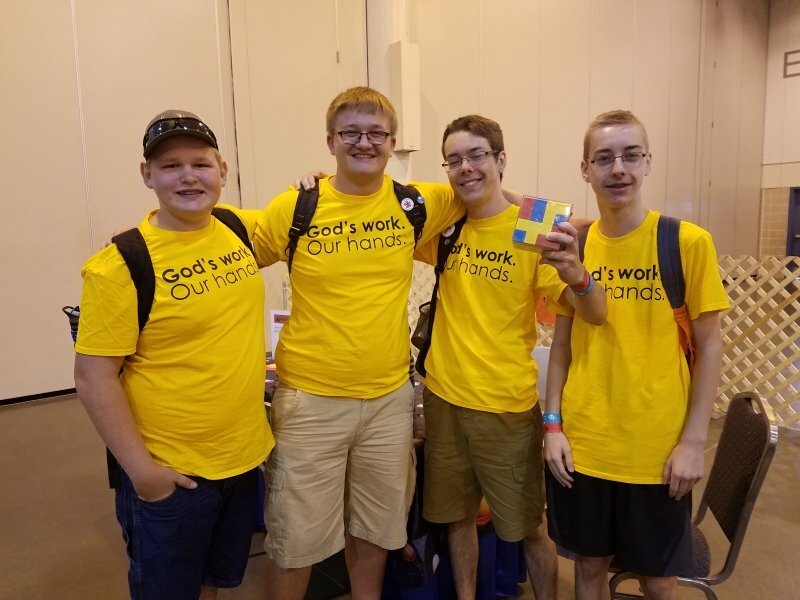 This is the second Youth Gathering LAFST participated in; the group took on the theme of Mythbusters at the 2015 Gathering in Detroit. 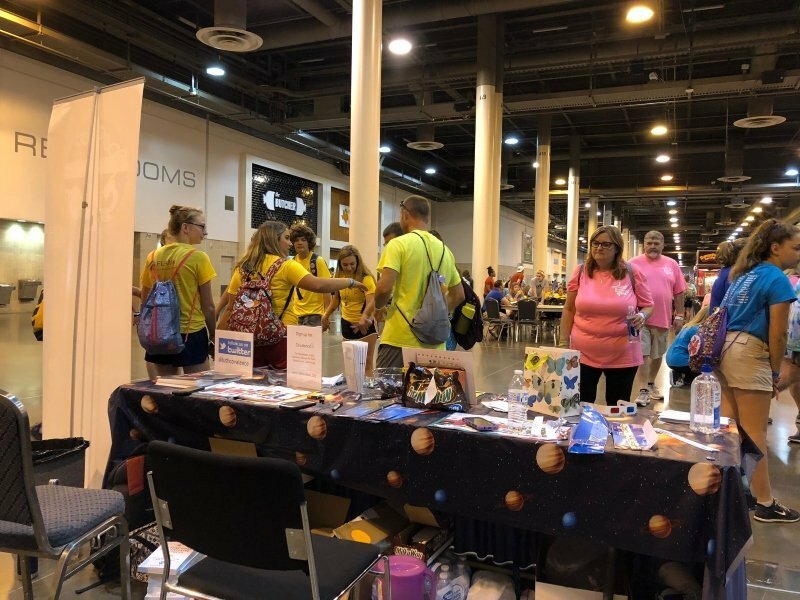 The theme of this year’s Lutheran Alliance booth was Exploring God’s Worlds: Seeing the world through the lenses of both faith and science opens up a new dimension. 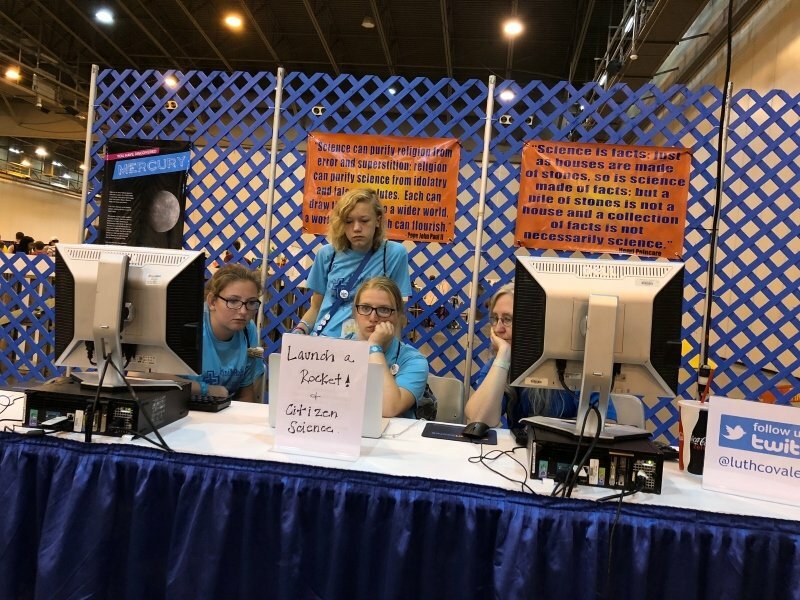 Four members of the LAFST Steering Committee staffed the booth: Bruce Booher, astronomer/retired ELCA pastor; Dana Hendershot, pastor; Ida Hakkarinen, NOAA meteorologist and physicist Kristi Keller. 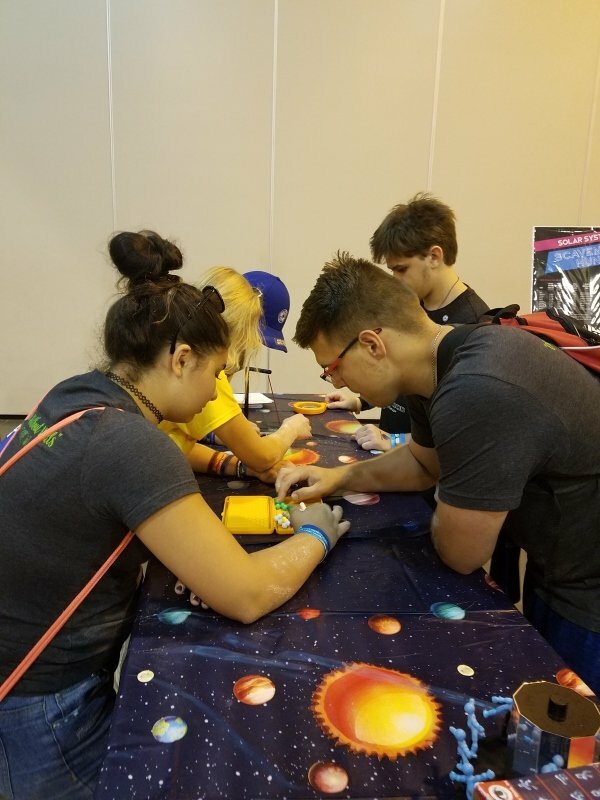 With a wide variety of science-oriented games and puzzles, the LAFST booth included a rocket simulator, a cut-out of a Mars Rover, science experiments and chances to discuss how faith and science play a role in daily life. A popular selfie opportunity drew youth leaders in the shape of a cut out of Astronaut Buzz Aldrin, who along with Neil Armstrong walked on the moon in 1969. Spread throughout the exhibit hall was a scale replica of the Solar System. 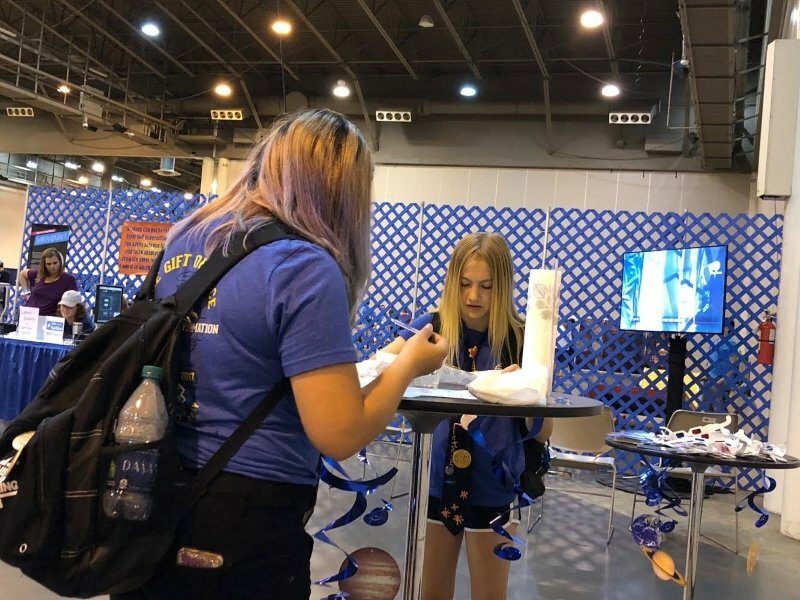 Over three days thousands of youth scanned through the large expanse of the NRG Center to find planets such as the last one in the line-up—a tiny blue ball with a disc (Saturn). Despite the center’s expansive square footage there wasn’t room for Uranus, Neptune or the most controversial planet Pluto. Posters for each planet were stationed throughout the hall at their scaled down distance from the Sun; the Saturn poster was located at the far end of the hall in the Old Lutheran store. 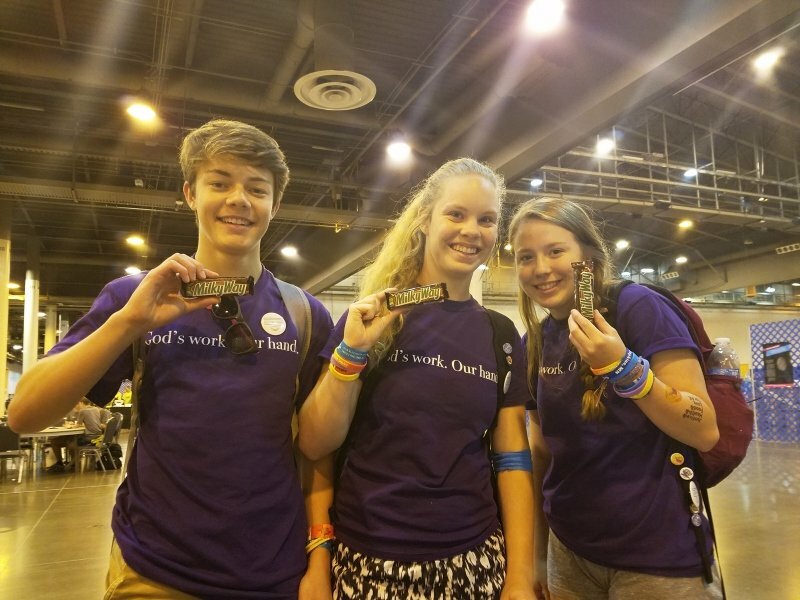 Participants who took part in the scavenger hunt and returned to the LAFST booth to show their photos of each poster were rewarded with a Milky Way bar. On the second day of Interactive Learning, a small gathering held hands looking as if they were praying. Actually, they had become a closed circuit with an Energy Stick, composed of an acrylic rod with LED lights and speaker than sounded once contact was made with both metal bands on the rod. Another toy, the Fun Fly Stick, demonstrated static electricity and the way in which like charges repel. Charge built up in the stick was transferred to a mylar band, which then floated in the air above the Fly Stick. 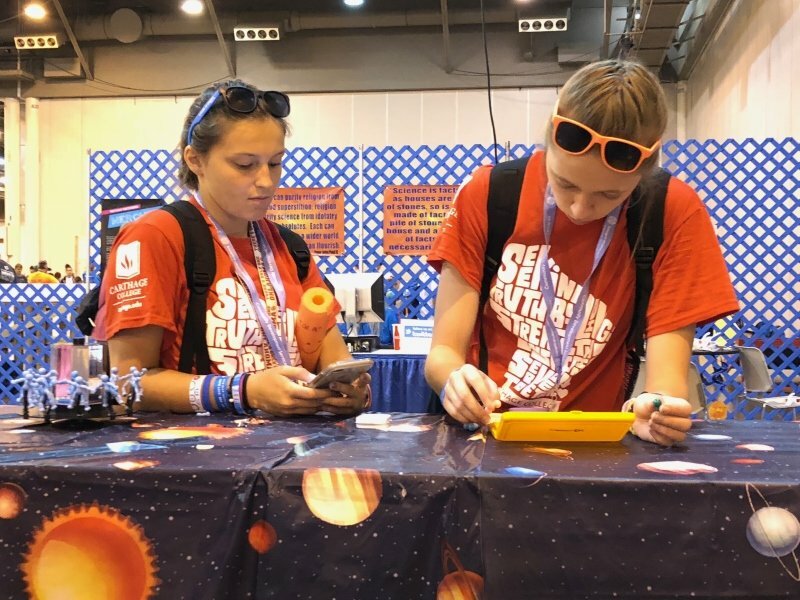 Hakkarinen recalls making the “rounds” on her scooter through the hall with one of the energy sticks, inviting people to participate in a scientific experiment about circuits and demonstrating the conductive properties of humans, and encouraging them to stop by the booth to “play with” other science toys. Another experiment had youth groups competing to see who can get the most water drops on the head of penny, which Hakkarinen says was another big hit. Impromptu small groups formed to work on several puzzles as a team. One group spent more than an hour completing a difficult 3-D Tetris cube puzzle. 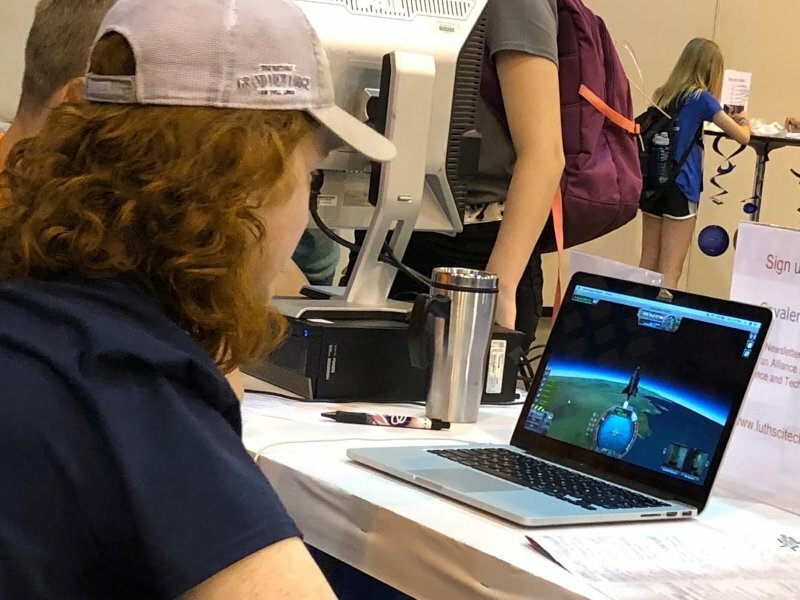 Keller guided participants through a computer simulator called Kerbal (www.kerbalspaceprogram.com/en/) in which they built and launched their own rockets. In addition, there were opportunities for youth and leaders to become citizen scientists via a website called Zooniverse. Less interactive, but just as fun, were science and 3-D videos playing continuously in the booth viewing area for those open to learning more about how science works more broadly. 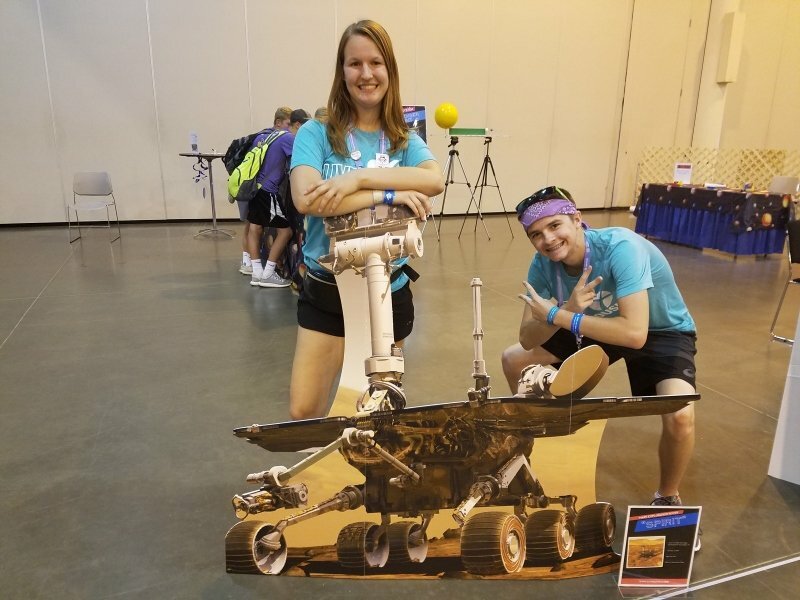 Youth and youth leaders also could take home a 3-D postcard of the Martian landscape with 3-D glasses and postcards with information about the Faith and Science Collective established at Holy Trinity Lutheran via a generous grant awarded by Fuller Seminary.